BROOKFIELD, SAMUEL MANNERS, building contractor and entrepreneur; b. 29 Nov. 1847 in Ecclesfield, England, fourth of the six children of John Brookfield, an engineer and contractor, and Mary Storrs; m. 28 Feb. 1877 Annie Waites in Ashton upon Mersey, England, and they had one son and a daughter who died in infancy; d. 22 Aug. 1924 in Halifax. Samuel M. Brookfield’s family immigrated to Nova Scotia in 1852, removed to New Brunswick, and returned to Nova Scotia in 1860. Samuel attended the Saint John Grammar School and later King’s Collegiate School in Windsor, N.S., before going to work as his father’s purchasing agent. Between 1862 and 1870 John Brookfield undertook much of the extensive rebuilding of the defences of Halifax initiated by the imperial government. He moved into civilian construction in 1866, taking over (from George Lang*) and completing the construction of the Provincial Building, designed by David Stirling*. Upon his death in 1870, Samuel assumed direction of the business. Throughout his career he would remain the most important building contractor in Nova Scotia. He also engaged in building projects in New Brunswick and Newfoundland. Brookfield’s most ambitious project was the construction and management of the Halifax graving dock. Technological change had undermined the Nova Scotian mercantile economy dependent upon wooden sailing vessels, and existing facilities were inadequate not only for the Royal Navy but for the steel-hulled steamships that were coming to dominate maritime commerce. Incorporated in London in 1885 with Brookfield as chairman, the Halifax Graving Dock Company was financed primarily by English capital, assisted by subsidies of $10,000 each for 20 years from the British Admiralty, the dominion government, and the City of Halifax. The dry dock opened in 1889, but demand proved disappointing and interest payments fell into arrears. The company restructured its debt in 1897, and Brookfield personally took over its operation, remaining managing director when his son John Waites Brookfield became manager in 1904. Increasingly he delegated the running of his construction business to Henry Roper, who was made manager in 1906 when the firm was incorporated as S. M. Brookfield Limited. By 1918 the graving dock had become sufficiently profitable to redeem all the company’s debt, although dividends were never paid to the shareholders. It had been damaged in the Halifax explosion of December 1917, but Brookfield had succeeded in getting it back in operation within two months. In June 1918, in order to create an integrated building and repair facility for steel ships on the east coast, the Canadian government proceeded with a controversial expropriation of the properties of the Halifax Graving Dock Company for $1,250,000; these assets were first leased and then sold to the newly formed Halifax Shipyards Limited. Brookfield and the other shareholders unsuccessfully contested the expropriation before the Exchequer Court of Canada, obtaining only a slight increase in compensation when the judgement came down in 1920. Brookfield’s drive to generate business for the graving dock involved him in both salvaging and shipping. The purchase and repair of the Ulunda, which had been stranded in the Bay of Fundy, led to the creation in 1892 of the Halifax, Liverpool and London Steamship Company, transformed the following year into the Canada and Newfoundland Steamship Company upon receipt of a Newfoundland mail contract. The company operated the Ulunda and two other vessels between Halifax, St John’s, and Liverpool on a year-round basis until sold in 1898 to Furness, Withy and Company. Brookfield was also instrumental in 1908 in the formation of the Halifax Salvage Association, noted for its success in retrieving the 10,000-ton Canadian Pacific Railway steamship Mount Temple that year. In 1910 Brookfield became the first president of the Maritime Telegraph and Telephone Company, which rapidly achieved a dominant position in the industry; he would hold the presidency until his death. Five years later he founded the Halifax Power Company, but his vision of exploiting the hydroelectric potential of the Northeast River near Halifax failed because of the difficulty of raising capital in wartime. Brookfield was also a key figure in the North West Arm Land Company, a firm headed by his son that engaged, unsuccessfully, in the development of a subdivision. Unlike contemporaries such as Benjamin Franklin Pearson*, John Fitzwilliam Stairs*, and William Maxwell Aitken*, Brookfield did not make significant investments in offshore enterprises. Instead he concentrated his energies at home, holding directorships in firms as diverse as the Nova Scotia Car Works and the Halifax Academy of Music, as well as dabbling in mining properties. He did, however, become a director of the Mexican Northern Power Company, incorporated in 1909. While opposing the closed shop, Brookfield accepted craft unionism and had the reputation of being a benevolent employer. A Methodist known for his generosity and a leading freemason, he served as a trustee and choir member of the Grafton Street Methodist Church and as a regent of Mount Allison College in Sackville, N.B., which awarded him an honorary dcl in 1917. He was the mainstay of the Protestant Industrial School for boys in Halifax, served as a director of the Protestant Orphans’ Home and the Young Men’s Christian Association, and was honorary president of the Boy Scouts, the Sailors’ Home, and the Navy League. Although a declared Conservative, he had little to do with politics except for a brief period (1876–77) as an alderman. Travelling to work by tram, by legend the earliest to arrive in the morning and the last to leave at night, Brookfield, an obituary noted, “was always to be seen at the motorman’s shoulder, waiting for the car to come to a standstill, and was the first, never the last, to alight.” His wife predeceased him on 23 Feb. 1909. Brookfield bequeathed his entire estate of $248,238.98 to his son, who also succeeded him as president of S. M. Brookfield Limited, renamed the Brookfield Construction Company Limited. Halifax County Court of Probate (Halifax), Estate papers, no.10787. NSARM, 1990-215/014, no.1; MG 1, vol.150c, nos.1-2; MG 100 vol.88, no.3.1. P. R. Blakeley, Glimpses of Halifax, 1867–1900 (Halifax, 1949; repr. Belleville, Ont., 1973). Harry Bruce, A century at Central Trust: the story of its growth (Halifax, 1987). Susan Buggey, “Building Halifax, 1841–1871,” Acadiensis (Fredericton), 10 (1980-81), no.1: 90-112. J. E. Chute, “Halifax’s new south end: the North West Arm Land Company and a parkland legacy,” Royal N.S. Hist. Soc., Journal (Halifax), 3 (2000): 33-53. The city of Halifax, the capital of Nova Scotia, Canada: its advantages and facilities . . . , comp. 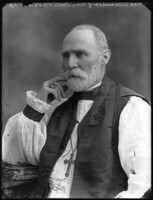 J. Isaacs (Halifax, 1909). In memoriam, Samuel M. Brookfield, D.C.L. (Halifax, n.d.). Ian McKay, The craft transformed: an essay on the carpenters of Halifax, 1885–1985 (Halifax, 1985). Henry Roper, “The Halifax Board of Control: the failure of municipal reform, 1906-1919,” Acadiensis, 14 (1984-85), no.2: 46-65. J. S. Scott, “The foundation and structure of a building business,” Port and Province (Halifax), September 1937. V. L. Settle, “Halifax Shipyards, 1918-1978: an historical perspective” (ma thesis, St Mary’s Univ., Halifax, 1994). Henry Roper, “BROOKFIELD, SAMUEL MANNERS,” in Dictionary of Canadian Biography, vol. 15, University of Toronto/Université Laval, 2003–, accessed April 24, 2019, http://www.biographi.ca/en/bio/brookfield_samuel_manners_15E.html.